This book offers novel insights into the way in which people talk about politics across various countries. Drawing on focus groups research in nine countries, including ‘mature’ democracies, post-communist ‘new’ democracies and post-authoritarian ‘new’ democracies, it offers comparative reflection on how talk about political activity is shaped by peoples’ perceptions of specific opportunities to participate, the issues that concern them and the broader political environment. 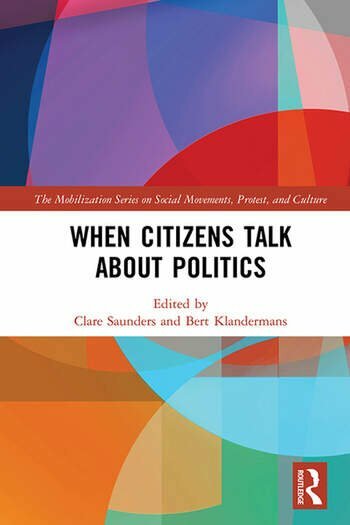 It thus examines citizens’ views of major issues and political grievances in their own words and helps to shed new light reasons for engagement in political acts, whether through electoral or protest channels, or political disengagement. Clare Saunders is Professor of Politics in the Environment and Sustainability Institute and Department of Politics at the University of Exeter, UK. She is the author of Environmental Networks and Social Movement Theory and the co-author of Politics and the Environment: From Theory to Practice and Prospects for Citizenship. Bert Klandermans is Chair in Applied Social Psychology at the Vrije Universiteit, Amsterdam, the Netherlands. His is the author of Social Psychology of Protest and the co-editor of The Handbook of Social Movements Across Disciplines, The Future of Social Movement Research, Methods of Social Movement Research, and The Wiley-Blackwell Encyclopedia of Social Movements.